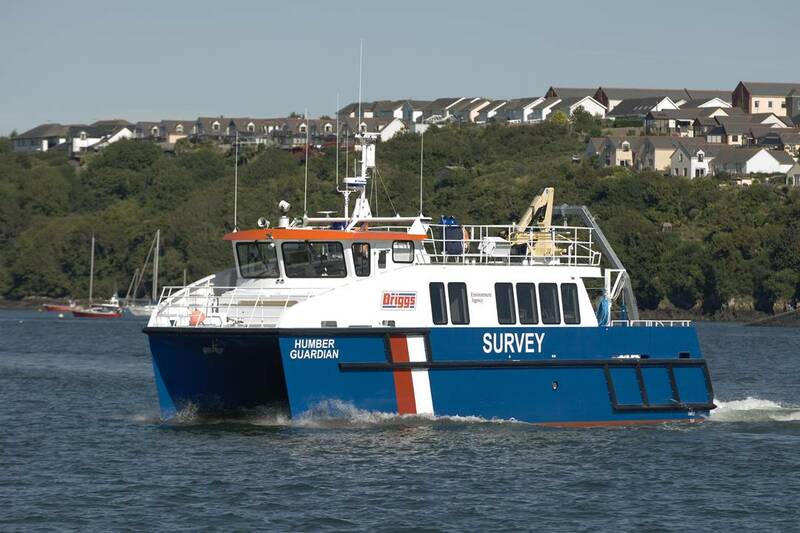 Incat Crowther is pleased to announce the launch and delivery of Humber Guardian, the first of three new coastal survey catamarans. UK’s Mustang Marine delivered Humber Guardian to Briggs Marine in August. The vessel will be deployed by Briggs Marine to support coastal survey operations for the Environment Agency of England and Wales.Incat Crowther worked with Mustang Marine and Briggs Marine to develop a practical, capable and rugged vessel.The vessel’s aft working aft deck features a 2-tonne A-Frame, Man-overboard davit and moon pool. A work bench is also fitted. The main deck cabin has three primary areas. The first of these is the large working space consisting of both wet and dry laboratories, as well as a day toilet. A data network has been installed, as has a fridge/freezer and two computer terminals for data processing. Forward of this is a crew space featuring a galley and mess, as well as access into the hulls. At the front of the cabin is a raised wheelhouse, affording excellent all-round visibility.The roof houses a RIB, launched and retrieved by the adjacent Effer 3700/1E hydraulic knuckle boom crane.This crane is fitted with a 600kg winch, capable of lifting a items with a maximum weight of 1300kg at a radius of 2.5m. Accessed via stairs from the galley/mess space, the hulls offer more comfortable live-aboard accommodation than previous vessels used by the Environment Agency. There is accommodation for six in three twin cabins, as well as a bathroom in one hull. Humber Guardian is powered by a pair of Volvo Penta D9-MH main engines, each producing 261kw @ 2200rpm. The power is driven through Twin Disc MGX-5075 gears to five-bladed propellers. The vessel has a service speed of 16 knots, and a maximum speed of 18 knots.